The Videx 4836/0 (4000 Series) is an AC audio speech unit module with no call button, for use with Videx 4000 series surface or flush frames. The unit clips in from the front is supplied with a protective film, retaining clips and name plate window, finish is mirror stainless steel. 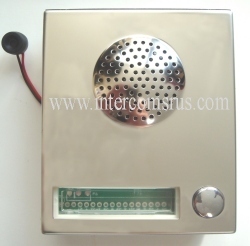 The Videx 4836/1 (4000 Series) is an AC audio speech unit module with 1 x call button, for use with Videx 4000 series surface or flush frames. The unit clips in from the front is supplied with a protective film, retaining clips and name plate window, finish is mirror stainless steel. The Videx 4836/2 (4000 Series) is an AC audio speech unit module with 2 x call buttons, for use with Videx 4000 series surface or flush frames. The unit clips in from the front is supplied with a protective film, retaining clips and name plate window, finish is mirror stainless steel. The Videx 4837/0 (4000 Series) is an DC audio speech unit module with no call button, for use with Videx 4000 series surface or flush frames. The unit clips in from the front is supplied with a protective film, retaining clips and name plate window, finish is mirror stainless steel. The Videx 4837/1 (4000 Series) is an DC audio speech unit module with 1 x call button, for use with Videx 4000 series surface or flush frames. The unit clips in from the front is supplied with a protective film, retaining clips and name plate window, finish is mirror stainless steel. The Videx 4837/2 (4000 Series) is a DC audio speech unit module with 2 x call buttons, for use with Videx 4000 series surface or flush frames. The unit clips in from the front is supplied with a protective film, retaining clips and name plate window, finish is mirror stainless steel. The Videx 8836/0 (8000 Series) is a audio speech unit module with no call button, it is the direct replacement for the 836/0 (800 Series) and will slide into the original frame, wiring as per original. 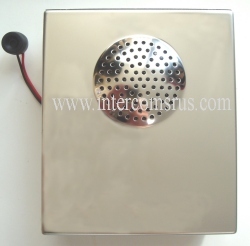 The finish is mirror stainless steel (unlike the original modules that were brushed stainless steel) NOTE : Will not replace "M" SPEECH UNITS they are special order. 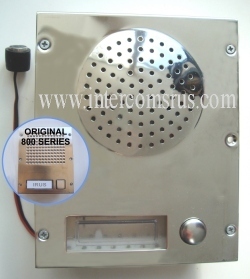 The Videx 8836/1 (8000 Series) is a audio speech unit module with 1 x call button, it is the direct replacement for the 836/1 (800 Series) and will slide into the original frame, wiring as per original. 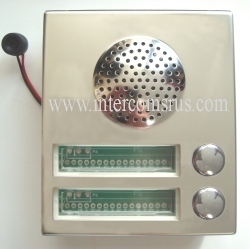 The finish is mirror stainless steel and the call button is round (unlike the original modules that were brushed stainless steel and had square call buttons) NOTE : Will not replace "M" SPEECH UNITS they are special order.